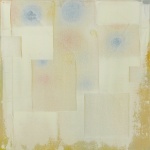 "Masaki Yada's paintings are found in renowned collections worldwide, including the Danish Royal Collections, the Zabludowicz collection, University of the Arts London, Alison Myners - Chair of Institute of Contemporary Arts (ICA), and many private collections in the UK, the USA, Denmark, Sweden, and Italy." Masaki Yada is a collectable emerging artist, his paintings can be found in renowned collections worldwide, including the Zabludowicz collection, Alison Myners - Chair of Council of Institute of Contemporary Arts (ICA), University of the Arts London, and many private collections. Yada habitually creates abstract paintings, exploring paint in its full range of textures from translucent inkiness to thick impasto. The paintings achieve a containment of elements both tangled and discreet, an embodiment of the painter's thematic concern with the idea of the city. Yada’s practice has taken a startling turn in mysterious amorphous images offset against a dark plane of colour, suggestive of new life forms, subterranean and self-created.